Silver Threads Upholstery - Victoria TX. 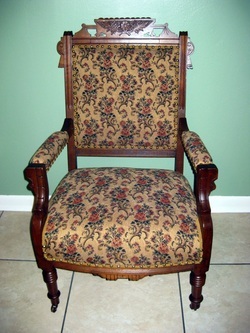 Quality furniture upholstery, antique restoration, and repair work. place. Silver Threads Upholstery offers high quality workmanship and materials dedicated to providing fine quality upholstery, fabrics, furniture repair, and antique restoration. Specializing in furniture upholstery & repairs, refinishing, cushions, upholstery fabric, high density foam, aircraft seat covers, boat seat covers, RV upholstery, and helpful advice. Re-upholstery of course, is not the right choice for everyone. If you have fine quality, solid furniture and you like the style and size, it could be the right choice for you. If your fabric is wearing or just out of style, it is usually less expensive to reupholster than to replace high quality furniture. If you have antiques or inherited furniture, the owner of Silver Threads Upholstery Vodie Brooks can make them as beautiful as they once were.